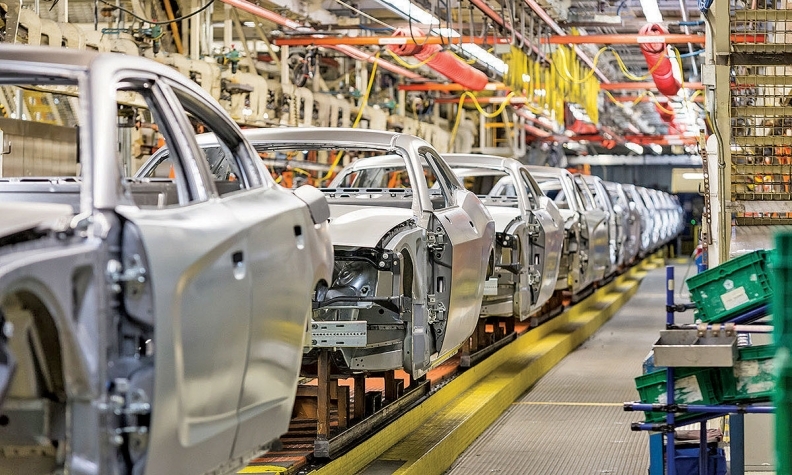 FCA's Brampton, Ontario, plant builds the company's large cars. 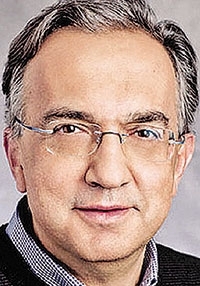 Even as Fiat Chrysler plans to outsource its compact and midsize sedans to another manufacturer, CEO Sergio Marchionne says he is totally committed to building the company's large cars in-house. 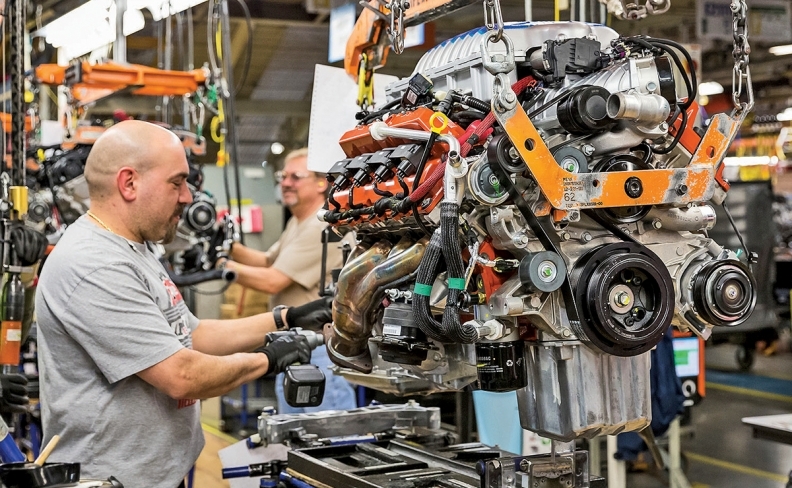 That's good news for Canadian auto officials working to ensure that FCA's assembly plant in Brampton, Ontario -- home of the Dodge Charger and Challenger as well as the Chrysler 300 -- stays open, and busy. But Marchionne also signaled a possible platform split among its full-size sedans and coupes by suggesting that the next-generation Chrysler 300 might move to the same platform as the Pacifica minivan. Speaking to reporters last month at a celebration of the 2017 Pacifica launch, Marchionne said the minivan's "architecture is capable of making the 300 successor -- a front-wheel/all-wheel-drive successor. That's why the architecture was designed -- it was designed to be that flexible." He indicated, however, that just because the minivan platform was "capable, it's not a commitment" to move the next-generation 300 to Windsor, Ontario, from Brampton. "Brampton is facing a completely different set of conditions and markets," from Windsor and its minivans, Marchionne told reporters in Windsor. "I think we'll deal with [Brampton] when the time comes. We've invested in that plant, too, to keep it running." Shifting the 300 to the minivan underpinnings would likely mean transforming the sedan from rear-wheel drive to more fuel efficient fwd with a nine-speed transmission. It would also mean that the next-generation Charger and Challenger -- as well as the Dodge Barracuda convertible coupe shown to dealers last year -- would be built in Brampton as rwd cars on the Giorgio platform FCA developed for the Alfa Romeo Giulia. The Brampton plant has received tens of millions of dollars from FCA since the automaker exited bankruptcy. 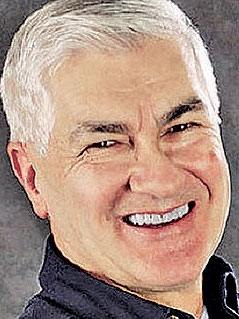 Ray Tanguay, the retired Toyota executive-turned-auto czar for Canadian Prime Minister Justin Trudeau's government, said FCA's Brampton plant "is a critical component of our automotive retention strategy." Tanguay said federal and Ontario economic development ministers "are very supportive and committed to continue to be excellent business partners." The 300 and Charger are among the last badge-engineered vehicles left from the DaimlerChrysler era, along with the soon-to-disappear Jeep Compass and Patriot. Though the two large sedans share many physical traits, their interior and exterior styling have set them apart. In January, Marchionne said that FCA was looking for another automaker to build the Chrysler 200 and Dodge Dart so the company could retool their plants to build more-profitable Ram pickups and Jeep SUVs. The Brampton plant's future has been less clear since FCA in 2014 withdrew its request for Canadian government incentives to retool the Windsor plant. Tanguay: Plant is critical to Canada's plan. The incentives had become a political football in provincial elections. FCA invested $2.6 billion to develop the Pacifica and retool Windsor to build the minivan. Also weighing on Brampton's future are negotiations this year with Unifor, the Canadian union representing the nearly 3,300 hourly workers who work in the assembly plant and an adjacent stamping plant. Since emerging from bankruptcy, FCA has quietly invested tens of millions of dollars in Brampton, including $20 million in 2011 for a lab to improve manufacturing quality. In December, Brampton earned bronze status under FCA's World Class Manufacturing system. World Class Manufacturing, introduced by Fiat when it took control of Chrysler in 2009, aims to reduce waste and injuries while improving quality and efficiency. It uses 10 managerial and 10 technical measurements for each job and action in a plant, and rates a plant's performance twice a year on a 100-point scale. A plant must achieve a score of 50 or better to achieve bronze status.